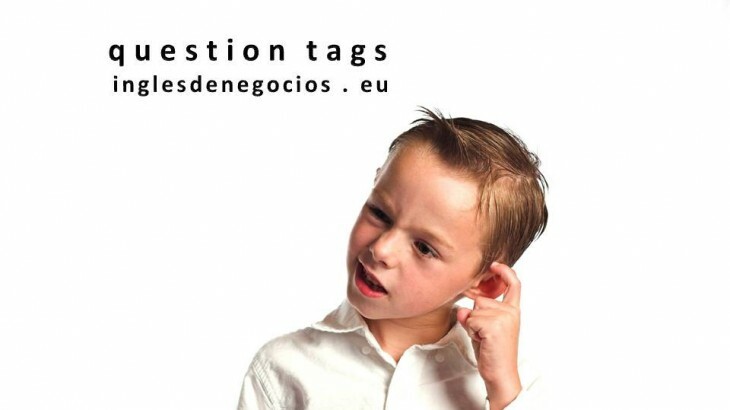 What are Question Tags and how can you use them? isn’t he? – don’t you? – have you? – is she? – haven’t they? He’s quite a good negotiator, isn’t he? You go to Brighton on Sunday, don’t you? You haven’t been to Cork, have you? She’s not going to complain about it, is she? They weren’t prepared to walk away from this deal, were they? He had gone too far, hadn’t he? I said that out loud, didn’t I? You don’t want to return this item, do you? She walks in a funny way, doesn’t she? You won’t go back to Ireland until Spring, will you? Write as a comment one sentence for each question tag you can come up with. Sin categoría aprender inglés, aprender inglés rápido, bonificada, business english, clases de inglés, clases de inglés a empresas, coletillas interrogativas, cómo se dice en inglés, empresa, formación, formación bonificada, idiomas, inglés, inglés de negocios, inglés de negocios vocabulario, inglés empresarial, inglés en Granada, inglés en Madrid, inglés en Málaga, inglés en Marbella, inglés en Sevilla, inglés gratis, inglés malaga, inglés online, málaga, negocios, posts en inglés, question tags, U24Business, YouTooForBusiness. permalink. You hace received the email today, haven’t you? She’s a good teacher, isn’t she? They’re not going to visit to Ireland, aren’t they? It’s not aceptable , is It? You don’t want to call him, do you? 1/We haven’t recived the payment, have we?. 2/ You don’t unload the truck,do You? 3/You don’t speak spanih, do You? 4/we don’t need your car, do we? 5/ In this moment She isvery Happy, is She?.